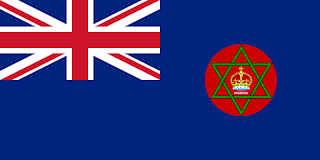 Modern day Nigeria came into being under the British Empire, and as such, used the common Blue Ensign with the coat of arms for Nigeria in the fly. The coat of arms was a red disc with a green 6 pointed star placed upon it. Within the star, the imperial crown. 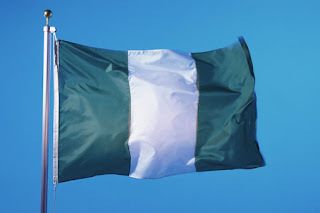 However, in 1959, a national competition was held to design a new flag for Nigeria with independence just around the corner. The winning design was submitted by Michael Taiwo Akinkunmi, a Nigerian student studying at Norwich Technical College. He saw and advertisement in the papers, and decided to join in the movement of his nation to independence. His winning design was a vertical tricolour of green, white, and green. However, where it was different from the flag in use today, it featured a red sun with rays in the central white stripe. However, the judges removed it, and it has been the flag of Nigeria ever since. Nigeria did not enjoy an easy move to independence with the military ruling the nation through various dictatorships almost constantly from 1966, to 1999. Indeed, the south of the nation is mostly Christian, and the north is predominantly Muslim. This led to growing religious and ethnic tensions, and in 1967, the south eastern region voted to seceed from Nigeria, forming the short lived (1967 -1970) Republic of Biafra. The Biafran flag was a horizontal tricolour if red, black, and green, with a golden rising sun in the centre. The sun had 11 rays, each representing the 11 regions in Biafra. The civil war eventually saw the armies finally defeat Biafran forces in 1970. Whilst Nigeria won, and reunified the nation, it still led to more ethnic strife in Nigeria. However, since 1999, Nigeria has made huge steps towards becoming a regional power. They have since orientated themselves to play an active role in peacekeeping in Africa, and play a much more diplomatic role in Western Africa.